For most tourists arriving in Cape Town for their vacation, Table Mountain is an iconic landmark that welcomes them from a distance. 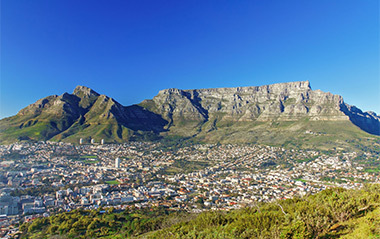 Other famous surrounding mountains forming part of the exceptional Table Mountain National Park include Lion’s Head and Signal Hill, while the beauty of Table Mountain is unmistakable, as it looms profoundly over the Mother City. At Mesmin Poba Touring, we ensure that travellers enjoying our half day tours or full day tours will have the opportunity to either visit Table Mountain or else take in remarkable views from the idyllic coastal suburb of Sea Point. Our Peninsula Full Day Tour embraces a discovery of Cape Town’s most beautiful natural assets and includes a visit to the scenic Twelve Apostles mountain range, which showcases a different side of Table Mountain as it runs through Kloof Nek and overlooks Camps Bay and Clifton’s breathtaking beachfronts, ending in Hout Bay. Other tours that involve Table Mountain experiences include our Half Day City Tours and Half Day Township Tours; however trips up Table Mountain are weather permitting. It is clear to see why former president Nelson Mandela once proclaimed Table Mountain to be “a gift to the earth”, while it easy to understand the friendly and inviting nature of Capetonians, who can appreciate this beautiful mountain every day, as they go about their lives. As one of the most photographed places not only in South Africa but also worldwide, the experience of travelling up the Table Mountain Cable Car or hiking up to the top with friends is unlike anything else. The Table Mountain Aerial Cable Car is considered one of the most popular tourist attraction in Cape Town and the views from the top of the mountain are extraordinary, with vistas across the vast Atlantic Ocean, surrounding city and attractions like the V&A Waterfront and Cape Town CBD. Rich in biodiversity, more than 1470 floral species call the space between Table Mountain and the Back Table home, many of which are endemic to the area and some of which are endangered. Table Mountain, with Devils Peak on one side and Signal Hill and Lion’s Head on the other side, forms a breathtaking backdrop in Cape Town, framing the City Bowl and Table Bay harbour. Table Mountain is one of the Official 7 Wonders of Nature, with its highest point being 1 085m above sea level. It is also interesting to note that Table Mountain is a whopping 260 million years old, which makes it older than the Himalayas, the Alps and the Andes.